As defined by 4.1,4.2 and tables 3 and 3 of BS 2724:1987 and according to the principles defined in appendix C1. NB - the instrument uses the graticule format proposed but has been optically redesigned and engineered for bench use and the viewing telescope is located for a seated inspector operation. 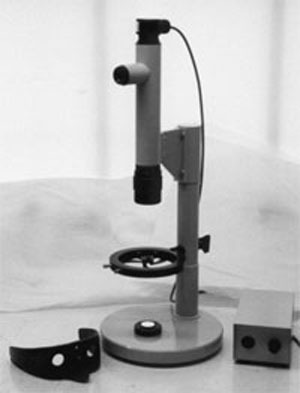 of this system over more expensive and less sensitive auto-refractors is that the inspector needs very little training to acquire competence of use and can make quick accurate judgements of all refractive property limits, defined by the Standards, to an accuracy of +/- 0.01 dioptres for sphere and astigmatic power, and, by viewing of the deviation of the target scale (if prism power is present) against a fixed cross-line graticule, the inspector can make a quick judgement as to compliance to the prism power limits defined by the Standard. the zero power calibration of the system can be checked by confirmation that the zero position of an engraved scale coincides with the reference line on the telecope when the target image is in sharp focus. the target is focused and any sphere power present can be observed by direct reading of the engraved scale which is in 0.01increments. The +/- 0.09 dioptre limit marks are coloured for easy observation that a product is within defined sphere power limits. A different colour marking at +/- 0.12 dioptres is displayed in anticipation of the wider class 2 limits which the pending European standard will permit. can be observed as the difference of focus between the hoizontal and vertical bars of the target graticule.